Another free update from Hello Games will be available from tomorrow featuring a lot of content that fans have been requesting since its last expansion. Initially leaked, Sean Murray from the developers studio has now tweeted the official trailer which shows off new planetary biomes, collectable exploration trophies and even procedural crash sites. This all comes less than a month after the Abyss update proving that the team at Hello Games are continuing to create the game they originally intended. Focusing on exploration, Visions will expand the diversity of the No Man’s Sky universe with players able to discover unique creatures which have evolved due to their strange habitats. For those who appreciate their collectables, you’ll be able to showcase ‘mysterious artefacts’ in your base once you’ve found them on your voyages around various galaxies. However, players beware because a more diverse world also comes with its fair share of dangers. Carnivorous trap plants and bloated gas flora have grown across the universe, ready to surprise careless travellers so keep your eyes wide open on your next adventure. 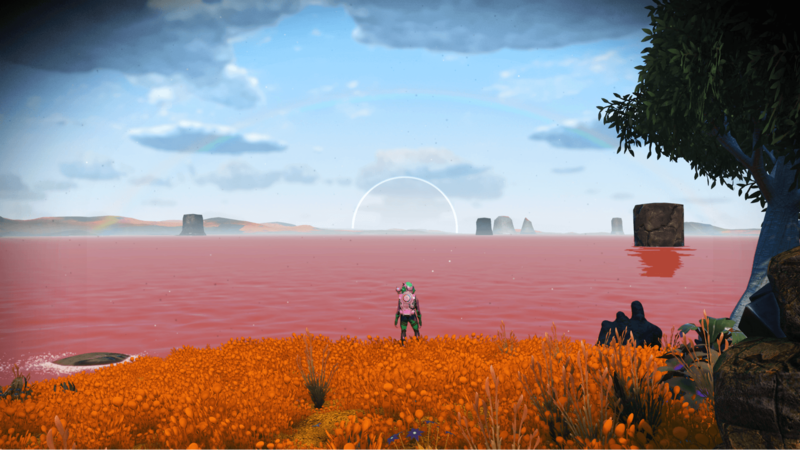 Further improving the aesthetics of the game, Hello Games have allowed the expansion of a more alien universe by incorporating new shades for the sky and grass. Different variations of water have also been implemented providing players unique worlds to discover below the ocean depths. Even small details such as rainbows have been added to enhance the immersive experience No Man’s Sky has become. Not only has the development team been able to produce much-wanted content, they’ve shown the beauty of their universe making it easy to spend hours exploring the landscape. Players who search dangerous planets will be rewarded for their efforts with crystal treasures awaiting your arrival. These are worth a decent fortune, but it’s up to you whether you’re willing to take the risk. If you’re not interested in this hazardous escapade then ‘unleashing your inner archaeologist’ may be your preference for earning your keep. Bones of ancient lifeforms have cropped up across the galaxies and are quite valuable, especially when the skeleton is completely intact. For more details on the update, head to the No Man’s Sky website and prepare yourself for your next grand adventure.